Journey North has all the things educators and members of the public are looking for when observing phenology. I found that their website's home page was useful, but the images represented for a handful of projects belies how much information is really there, and how many lesson plans and resources are available for everyone. Of course you should start on their home page, read a bit about their projects etc., but for educators I'd go for the meat of the website and the teacher's pages. They have information for you about getting started, setting up an account so you can upload your sightings to real-time maps, teaching tools, advice from other teachers, teaching standards, and more. They even provide a graphic organizer and worksheets to use for the different citizen science projects. 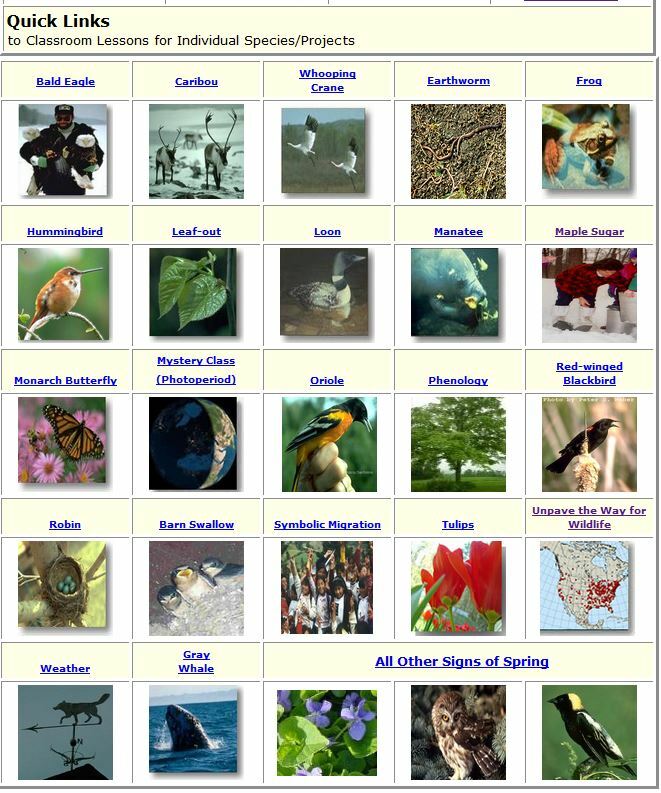 Now if you're just a Spring-Watcher and you enjoy citizen science, without teaching, this website is still for you. You can help them with uploading sightings and important migration and phenology information. Examples of real-time data maps that you can contribute your sightings to, or use for teaching, on the Journey North web page. Like most citizen science websites you can make observations and post data using their free smart phone app for iPhones and Androids. The idea is that you, or your students, take weather data, plant flower bulbs and observe their blooming times, track migration of monarchs showing up in Spring or Fall, observe first leaf-out, look for robin nests, and more. This is a great way to get children (and adults) looking for change, sharpening their observation skills, and for teachers meeting teaching standards. Life cycles, weather, climate, and phenology are all parts of the new Next Generation science standards for elementary and middle school grades and Journey North provides the means to meet them. I'll be doing a blog post on Journey North for my Citizen Science in the Classroom series soon, on the blog SciStarter, so keep an eye out for an in-depth look at how this project meets specific standards. In the mean time catch some of my other posts on their blog. 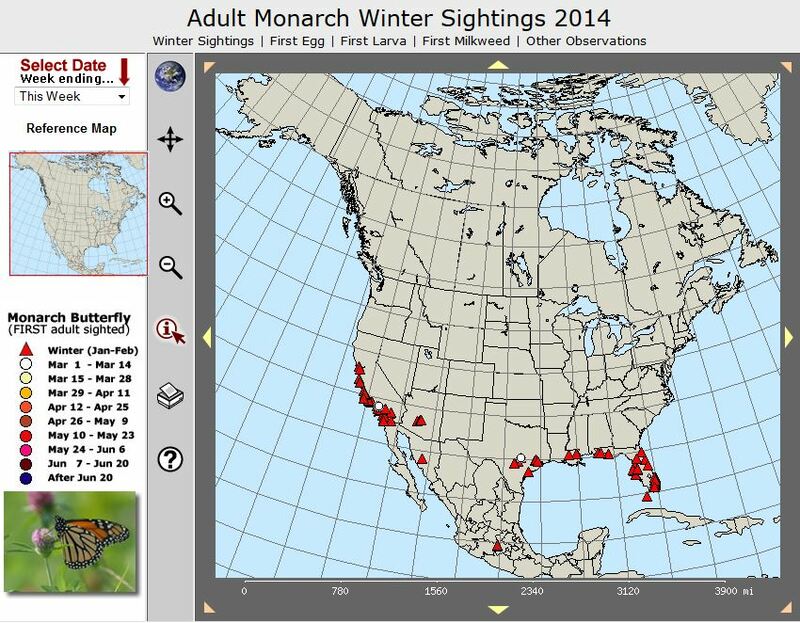 This winter's most recent map showing winter sightings of adult monarch butterflies in North America, on the Journey North website. The reason I'm so in love with this website is that it's completely user friendly, they have information that is accessible for children, with their "kids" pages, maps and facts for grown-ups, and pages and pages of teaching materials for educators. 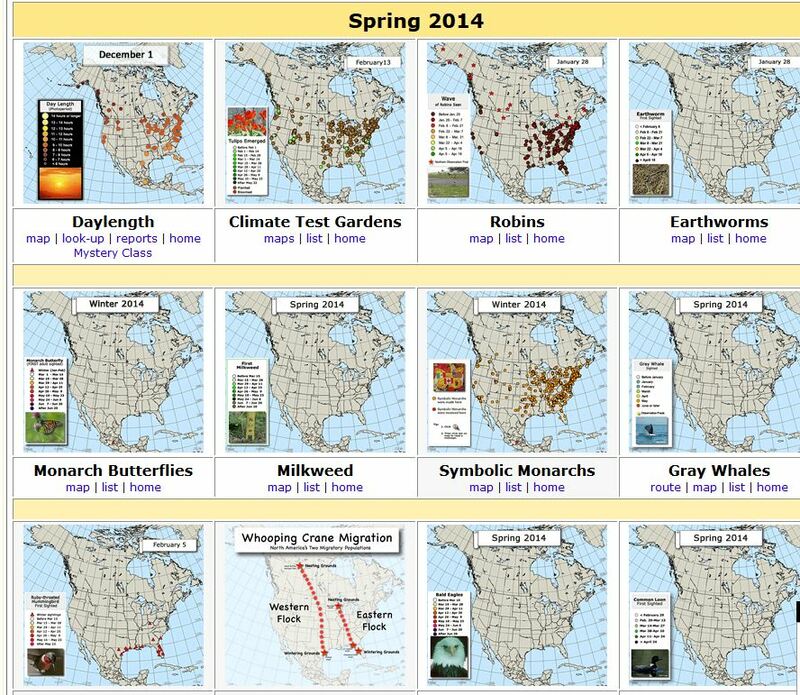 Their maps are real-time images of phenology, seasonal changes, and you can actually watch the monarch migration on the maps as Spring comes on and people post sightings, or you can track where the whooping cranes are flying currently, you can even see where people are posting about leaves popping out and gauge when you'll see leaves in your region. This is a great tool to have in your arsenal of teaching tools, whether you're in an urban environment or rural setting. It's also a great way to get involved in citizen science as a household or for your own enjoyment. Regardless, take time to enjoy spring, learn to observe it, and help researchers in the process!